Just to say thanks for arranging delivery of the greenhouse. It looks great, your fitting team were superb. The view through the garden gate through the glasshouse towards Hambledon hill works really well. The greenhouse is fantastic. The lads did a brilliant job & were very professional & really pleasant. It was a pleasure to meet them & are great ambassadors for your company. The glass house is perfect and has been admired by many. It is like an open secret; it’s there but invisible. Your installation is one of the nicest things that has happened to our garden. It will be a deeply contemplative room in which I expect to drink many cups of tea and glasses of wine before, during and after gardening. 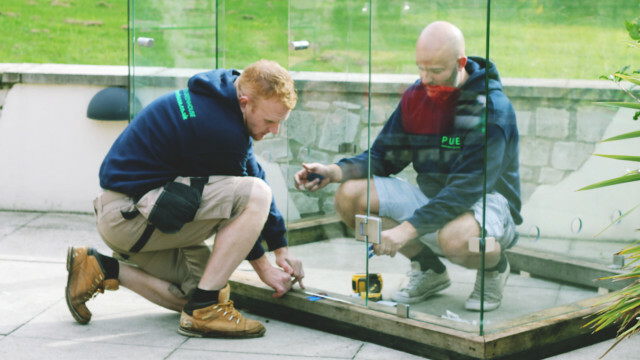 The creation of our toughened glass, frameless greenhouse came about through our involvement in the glass industry and our love of Gardening – something that we all hold very close to our hearts. We felt that something was missing from the Greenhouse industry. Why was it that ugly greenhouses had to taint beautiful gardens? Commonplace in today’s market are Metal framed greenhouses, as well as timber framed and plastic framed poly tunnels. Whilst the wooden framed garden greenhouses are very beautiful they can be be extremely expensive and involve a lot of upkeep and maintenance. The metal framed greenhouses can be cheap and functional, something you may want to hide away. 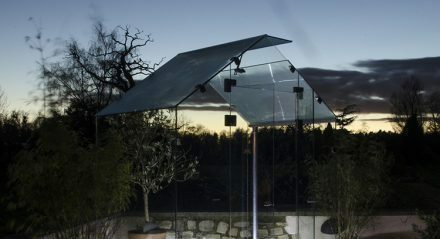 The Pure Greenhouse is a totally frameless glass structure made from toughened 10mm glass and is held together by 16 100% stainless steel brackets (All the fixtures and hinges are 100% stainless steel) allowing the maximum light to reach your plants. 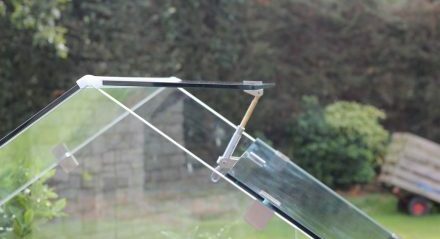 The Pure Greenhouse also has a Brand new and innovative full ridge glass to glass ventilation system, This enables you to achieve maximum ventilation levels only regular seen in commercial greenhouses and along with 8 smaller vents at lower level and double doors at a whopping 780mm wide it gives you numerous options for you ventilation. 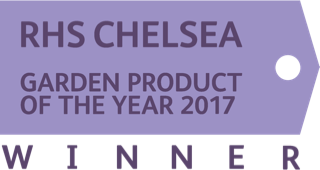 Not only does your Pure Greenhouse have a Fantastic ventilation it also has brilliant thermal qualities for the winter months due to its 10mm thick glass and the fact that it is a totally sealed structure when all the vents are shut making it ideal for winter growing. 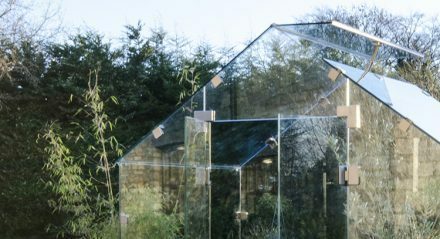 Our beautiful frameless garden greenhouse is also a dream to clean unlike framed houses, with a totally seamless interior you can sterilise and clean it in minutes and it also holds no crevices or frame for all those creepy crawlies to hide. The Doors also have no threshold so there are no trip hazards or access restrictions for your wheelbarrows. 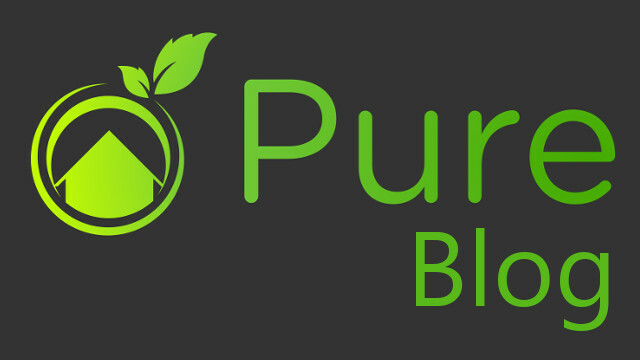 When you purchase a Pure Greenhouse we will arrange a delivery time and installation date. Our team will make sure everything is installed and up and running to your satisfaction. 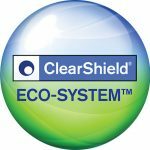 Finally a transparent shield is applied to your greenhouse, giving it a hard and durable water repellent and non-stick surface, a must to keep your beautiful frameless greenhouse Clean. Showing at all major RHS shows 2018, Chelsea, Hampton Court, Chatsworth house, Malvern.